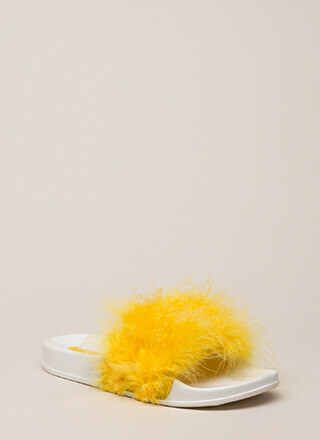 You've got a fine feathered friend in these T-strap heels. Strappy, open-toe, vegan suede heels feature an open sandal design with a slingback ankle strap, an adjustable buckle, and a T-strap embellished with faux feathers for a furry look. Shoes are finished with a stiletto heel and a ridged sole.